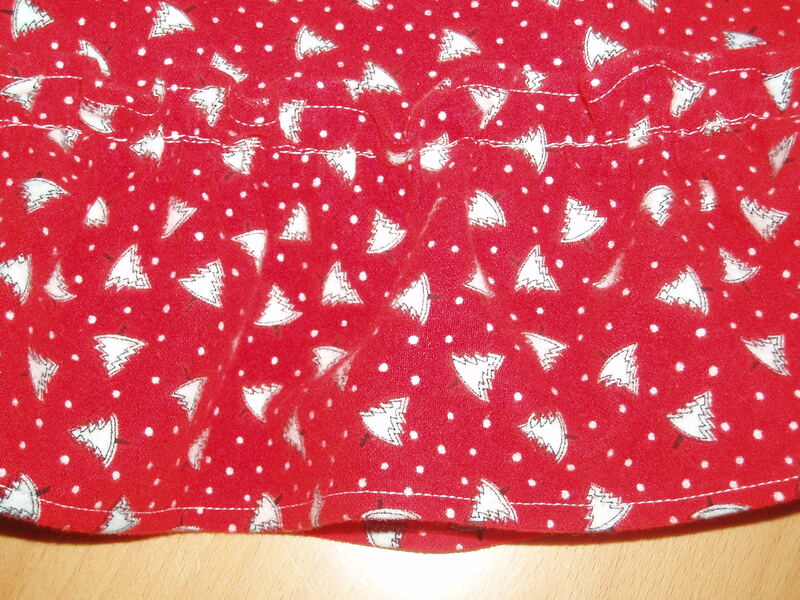 that I am no longer updating this blog and have moved my content to SEWN. I have noticed that people are still subscribing to this old blog’s feed and I don’t want you to be disappointed when there are no updates here. Please come see the exciting stuff happening at SEWN! For the brand new year, I have a brand new name and home for my blog, SEWN. I hope you will join me there from now on to follow me on the next chapter in my sewing life. I will no longer be posting on this site, but will keep it up for a while. Please add the above link to your RSS feed or reader to keep getting my latest posts. See you over at SEWN! Ah 2010, you went by so quickly. Is it just my age or having a child that makes time run past me without looking back? Man, it was just two weeks ago that it was 2009 and now it’s two more days until 2011. How did that happen??? Anyhoo, here’s a recap of what I was able to accomplish the year that happened in the blink of an eye. * The .5 refers to the tweed version which was almost completed until I figured out I had gained too much weight to wear it. It now lays crumpled on my table taunting me with its svelte, plummish, crumpled tweediness. 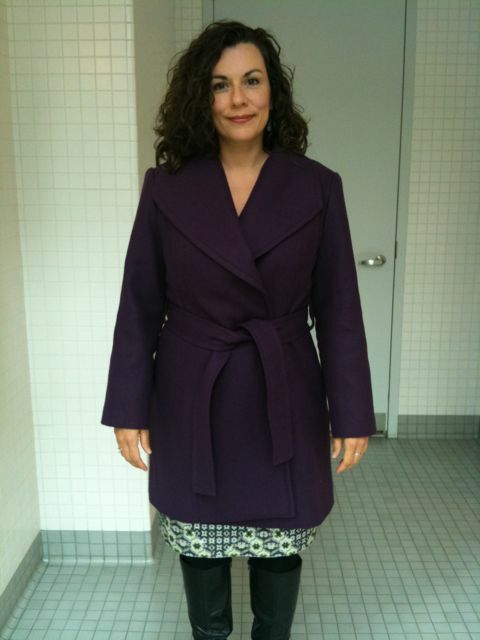 The Knip Mode skirt that would not drape/pleat correctly and made me look 20 lbs heavier. I was attracted to its architectural qualities with nary a thought as to how it would look on a middle-aged body. *sigh* I love you Knip Mode skirt but you would look good only on the circa 1996-1997 Elizabeth. RIP Knip Mode skirt. The almost 4th version of the B5147 sheath dress in the most beautiful shade of plum tweed you ever saw. But alas, I discovered too late that I had gained weight and set it aside for when I lost said weight or when Armageddon came, whichever came first (probably Armageddon at the rate I’m eating and drinking). The Simplicity 2337 ponte knit dress which I set aside in favor of actually finishing my Xmas sewing on time. It waits patiently for me on my sewing table (aka the dining room table) to come back to it as soon as I am able. I. can’t. wait. In no particular order, the highlights of this year were plentiful and varied. 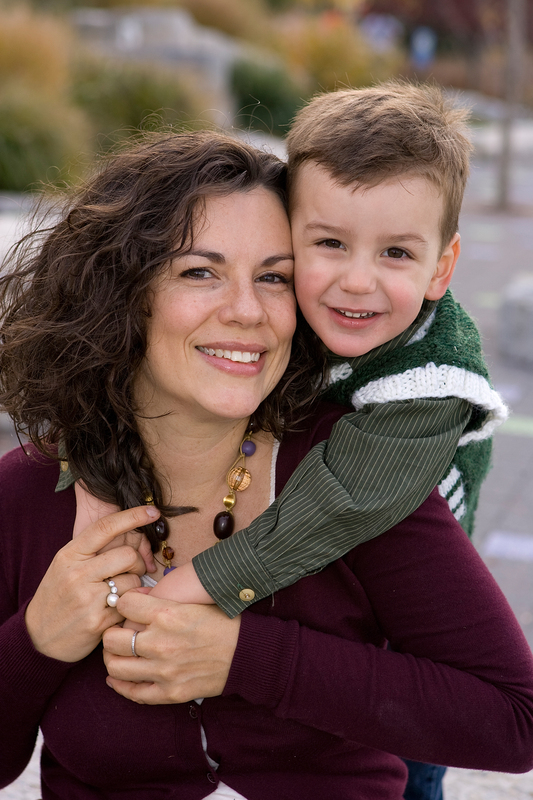 My son Jack entered his wonderful 3’s and I saw him blossom as he discovered and interacted more with the world. His new-found autonomy was a little challenging, but amazing to watch. I can’t believe I was left in charge of someone’s life, but I hope I’m doing an ok job of it, because it is just jaw-dropping how much his own person Jack is already. It doesn’t hurt that he loves when I sew for him either. 😉 He wore his Xmas jammies 3 days in a row! One of my greatest pleasures, besides the actual act of sewing, is talking about sewing with my far-flung friends around the world who share this same passion/obsession. 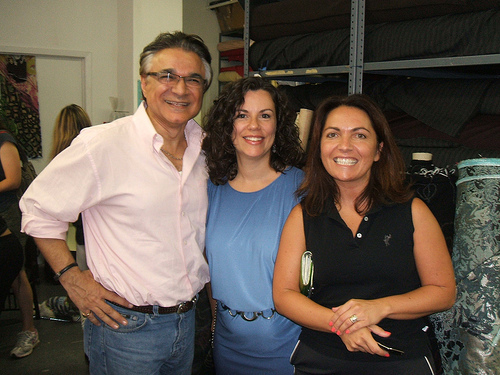 I organized a New York City shopping day in August with Robin and was blown away by the response and attendance that day. The fact that I have met fellow sewists from London, Hong Kong, Philly, Chicago, etc. just amazes me. 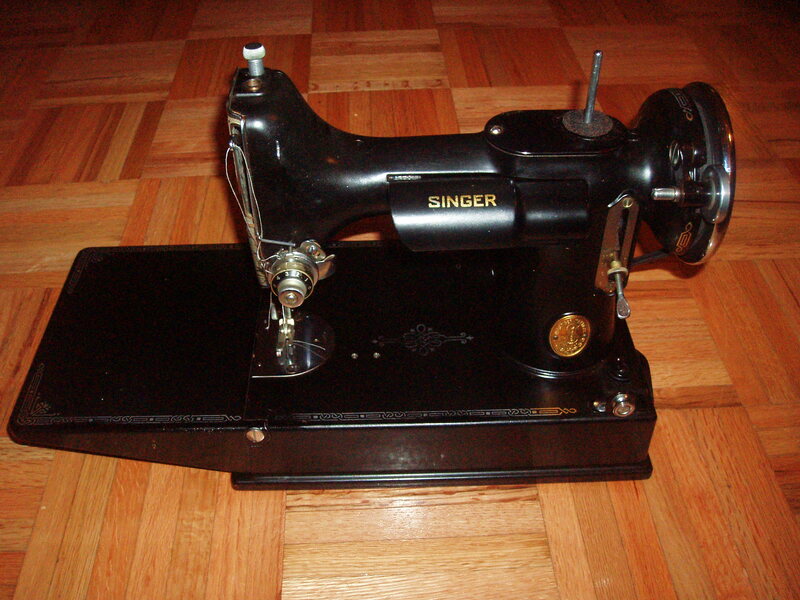 And last, but not least, I adopted a Singer Featherweight machine. 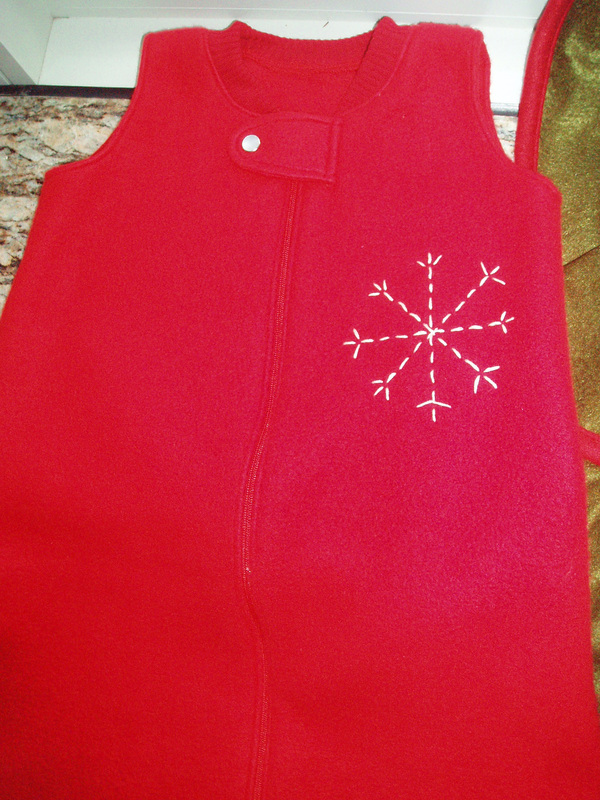 I haven’t sewn much with her yet, just a totebag, but 2011 promises to be the year of the Featherweight. Just you wait! Now if you’ll excuse me, I have some major housecleaning to do before 2011 bustles in. Happy new year my fellow sewists! 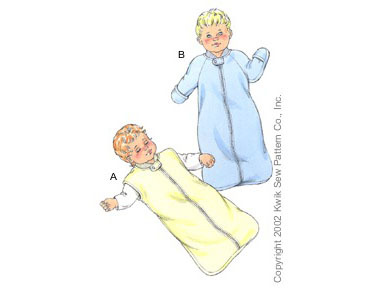 ﻿Pattern Description: Baby Sleep Sack. I made View A, the sleeveless version. Pattern Sizing: XS, S, M, L, XL. I made the size M. I made it for my three month old niece Chloe. The medium size is for 3-6 month olds. My parents are bringing Chloe’s and Haley’s pj’s to Madison tomorrow. I hope they fit! Did it look like the photo/drawing on the pattern envelope once you were done sewing with it? Yes! Well, except for the embroidery I added. Were the instructions easy to follow? The instructions were great. I didn’t have any problems with them. What did you particularly like or dislike about the pattern? Likes: Very simple pattern with only a few pattern pieces. 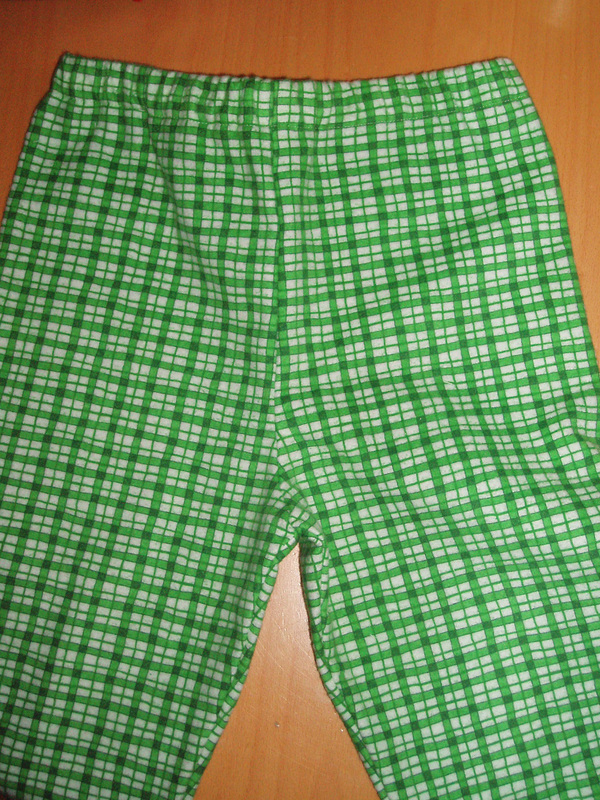 It was relatively quick to sew because of it. From start to finish it was about a 3 hour project. 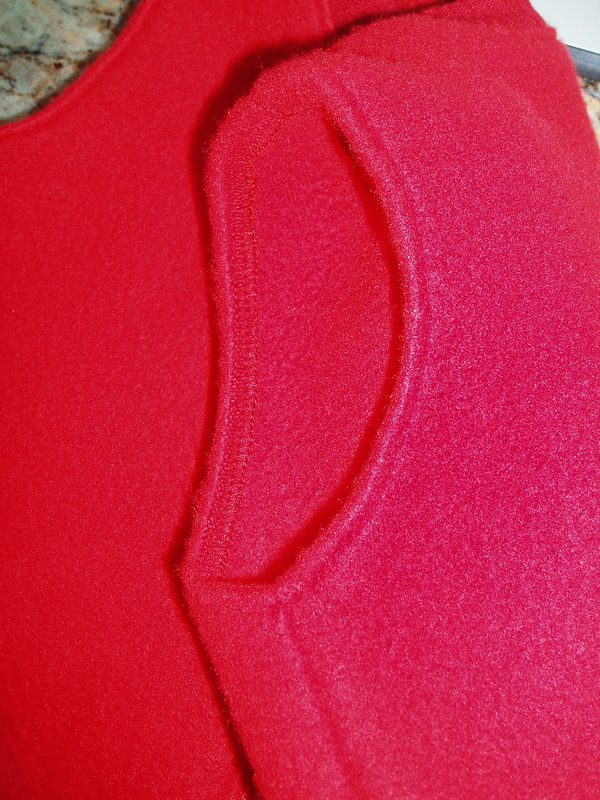 I did not like the finishing for the armholes. They instruct you to overcast the edges and then just turn it over and stitch it down. I think a binding would look a lot nicer, but due to holiday time constraints, I just did as instructed. It’s fine and most likely a non-sewist would not notice the finish. The neck band is a little fiddly to attach. Make sure you read all the way through to the end of the instructions for that section or you’ll make the same mistake I did of sewing the zipper SA’s prematurely. It wasn’t a fatal flaw, but it would have looked nicer had I followed the letter of the law. Live and learn I guess. Any difficulties encountered? Aside from the neckline issue mentioned above, the only other thing I had a hard time with was the top stitching around the zipper. The instructions tell you to stitch 1/4 in away from the zipper, I, of course, stitched too close, so it was hard to get around the pull and the end of the zipper. 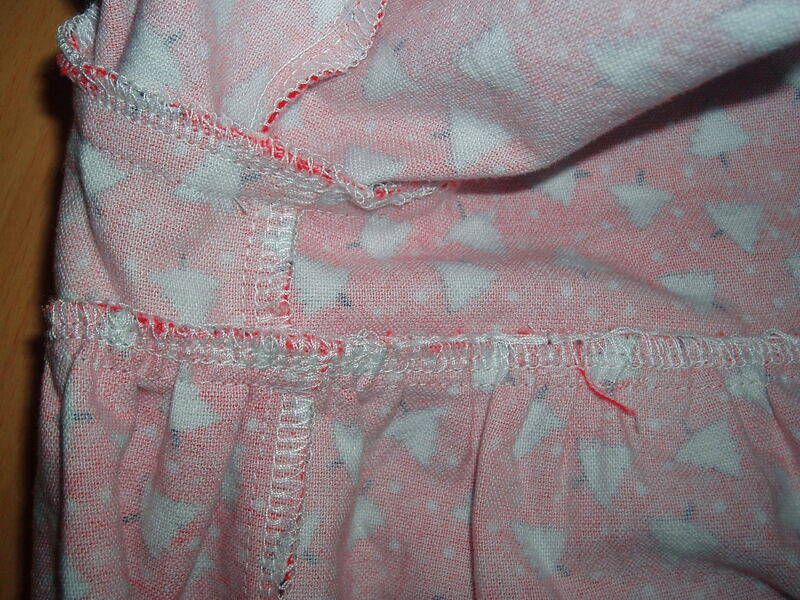 My stitching is a little wonky in that area, but I don’t think anyone but a perfectionist would notice. Fabric Used: I used a polyester fleece from my local sewing store P&S Fabrics in Downtown NYC. It was soft and fluffy and perfect for this sleep sack. It will be soft against a baby’s skin and will keep Chloe really warm on those cold Madison nights. 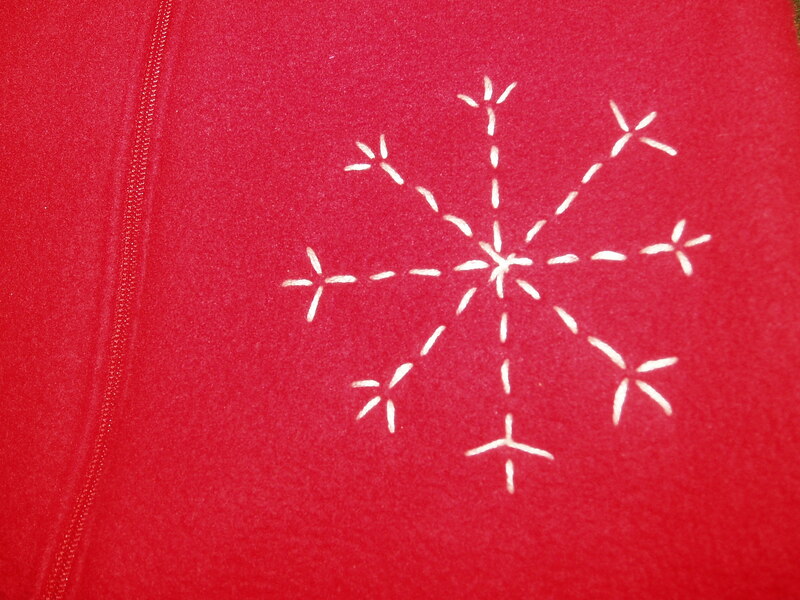 Pattern alterations or any design changes you made: I added some hand embroidery to relieve the simplicity of the project, a little snowflake in ivory embroidery floss. Normally I would only use 2 or 3 threads of the floss, but I really wanted it to stand out, so I used all 6 threads. Would you sew it again? Would you recommend it to others? I will definitely sew it again. I think it makes a great baby gift and you can personalize it rather easily. I do recommend it for any sewist. 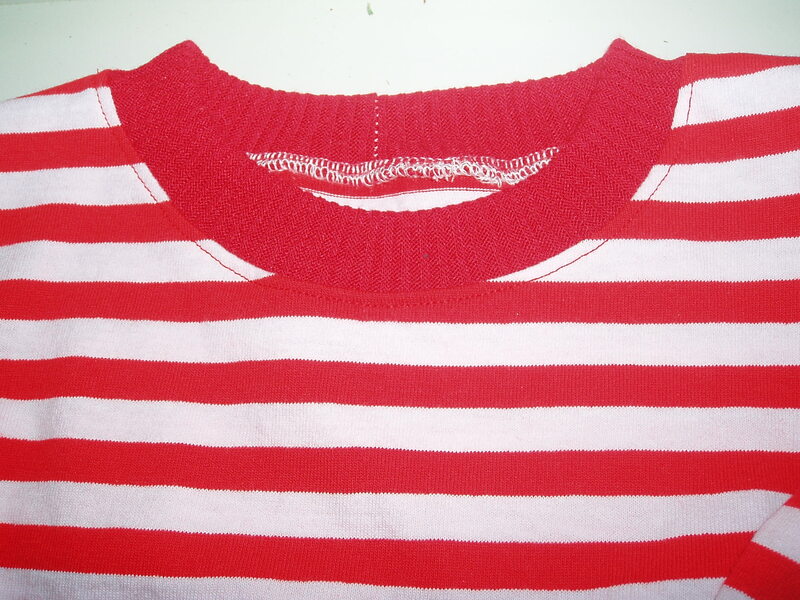 Beginner’s might find the neckband a bit of a challenge, but not out of reach skill-wise if done carefully and slowly. It’s a pretty quick project compared to flannel pj’s. Conclusion: I love the sleep sack and am pleased to give it to my new little niece Chloe. Hopefully I will have a picture of her in it soon. After making two flannel jammies for my niece and nephew, Thor and Katie, I took the easy route with my son Jack’s and my niece Haley’s pjs. 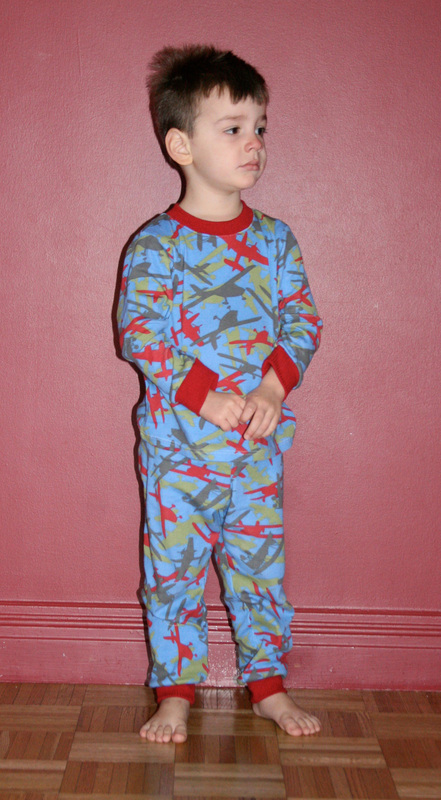 I made them another set of Kwik Sew 3510 knit jammies, like I did for all the kids last year. Here’s my pattern review from back then. Again, I did not have any issues with sizing. And again, I constructed this almost entirely on the serger. I did have two things different this time around though. I have a new tool that I wanted to use in this iteration, a stretch twin needle for the hem. The knits I used, a plane camo from the FabricFairy.com and a red and white stripe knit that I can’t remember where I bought it, were pretty stable so I didn’t have to stabilize the hems at all. I fiddled around with stitch length and thread tension and found that a length of 3.0 and tension of 2 was perfect for the twin needle stitch. It made a beautiful hem. When I made the sleep sack (review forthcoming) for my niece Chloe, the instructions said to top stitch the neck band SA to the body of the sack. I loved how finished the inside looked without that SA flopping around so I used that trick for Jack’s and Haley’s knit jammies too. It looks great! 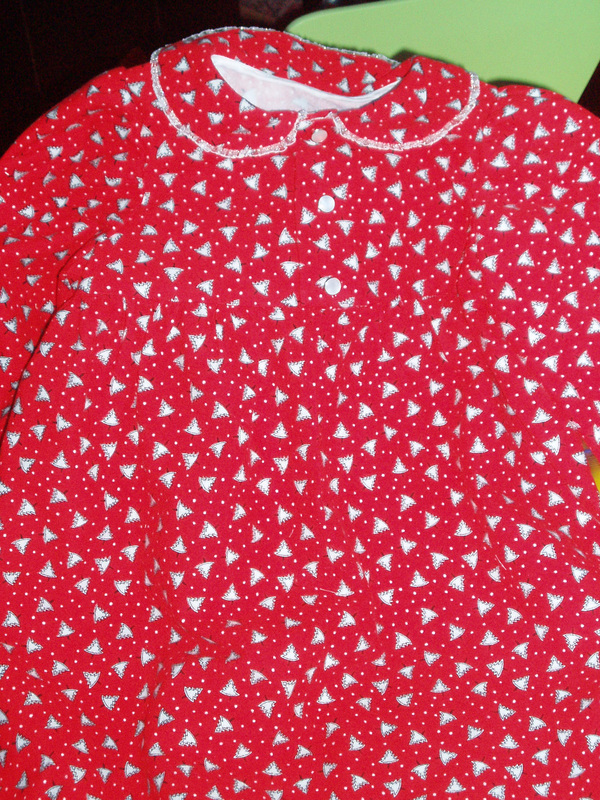 ﻿Pattern Description: Toddler Nightgown and Pajamas. I made View B, the nightgown. Pattern Sizing: 1/2, 1, 2, 3, 4.I made the size 4. It’s a little on the big side in regards to width and little short in length for both the skirt and sleeves. Again, therein lies the perils of making a gift and not having the luxury to fit as you go. 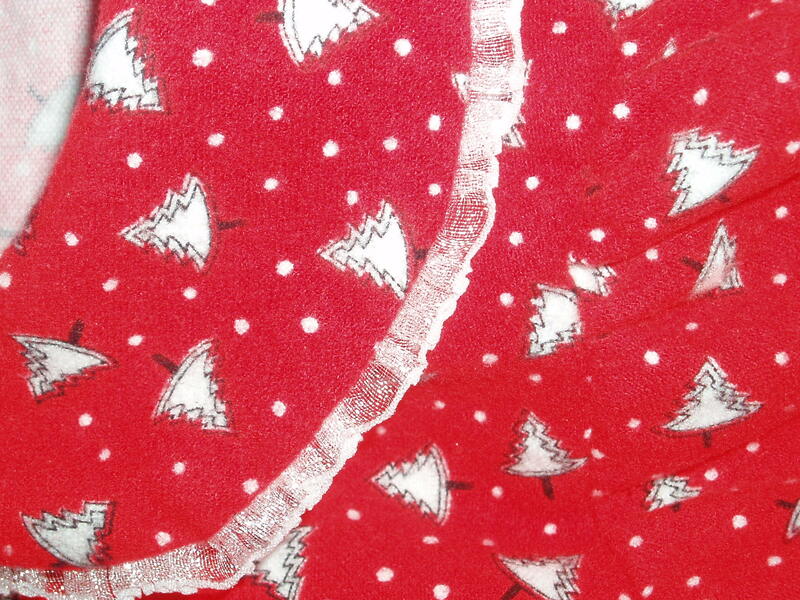 Did it look like the photo/drawing on the pattern envelope once you were done sewing with it? Yes! Were the instructions easy to follow? The instructions were great. I didn’t have any problems with them. Yeah me! 1. 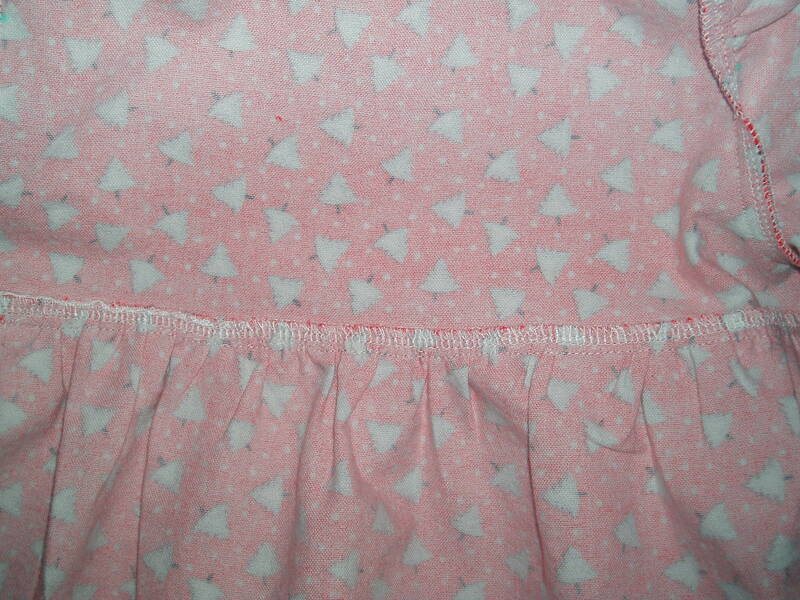 There was no instruction for finishing the join of the bodice to the skirt nicely; it just said to press the SA up. It would have looked really messy, not to mention have felt uncomfortable and scratchy. So I serged the SA and it looks much nicer now. 2. 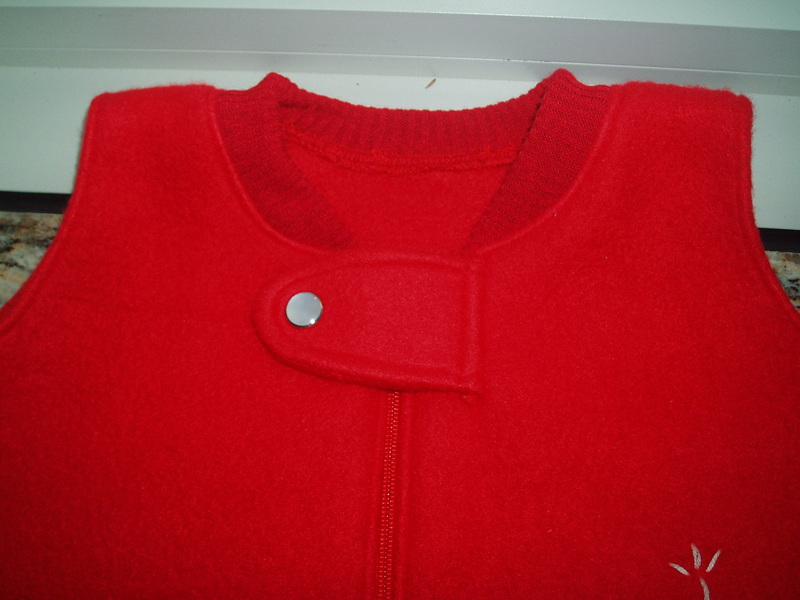 I’m not fond of how the collar is attached and the use of bias tape to finish the exposed collar SA’s. Next time I make this I will use self fabric bias tape. It will be prettier and softer. It would lie more nicely if there was a stand for the collar, but that would increase the construction time for the pattern. 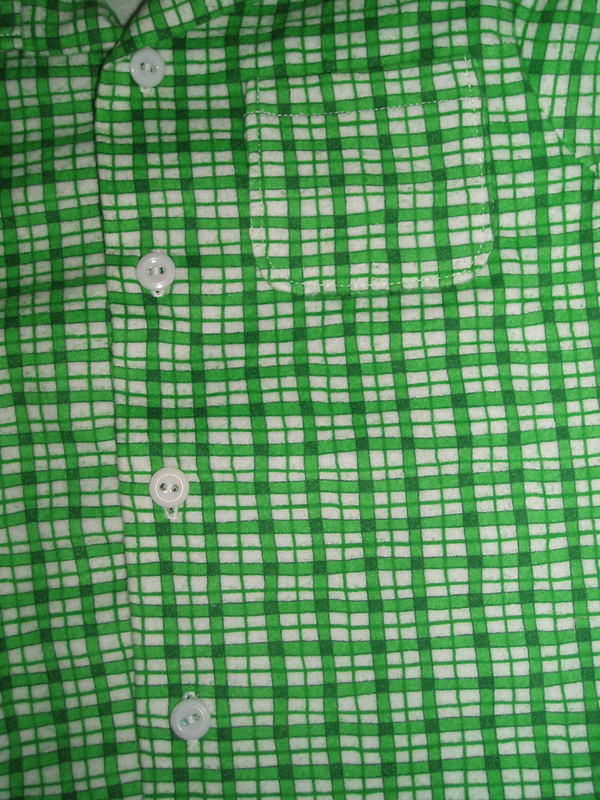 Fabric Used: Again, another gorgeous flannel which had a great hand, was soft and fluffy, nice and thick, and easy with which to work. 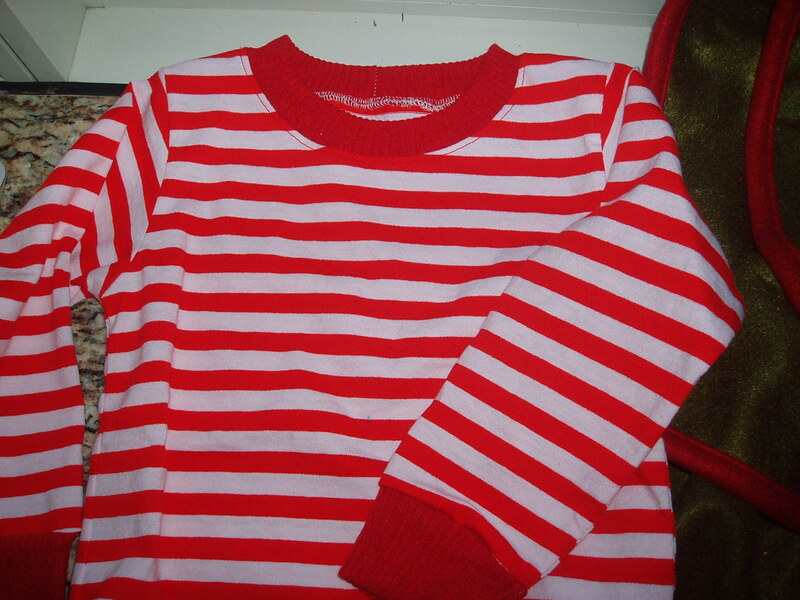 I bought it from Fabric.com in November but it has long since sold out. Sorry! I used snaps instead of buttons on the bodice. 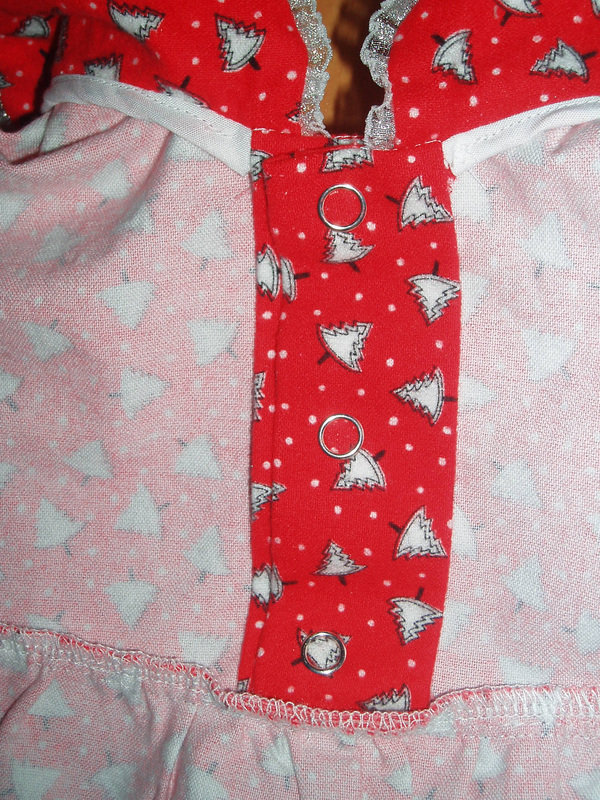 I think by this, the second set of flannel jammies I made, I was approaching sewing detail overwhelm, so snaps just seemed faster and easier. I love how they look. And again, I finished the interior construction serging all exposed seams for a nice clean finish. Would you sew it again? Would you recommend it to others? I will definitely sew it again. 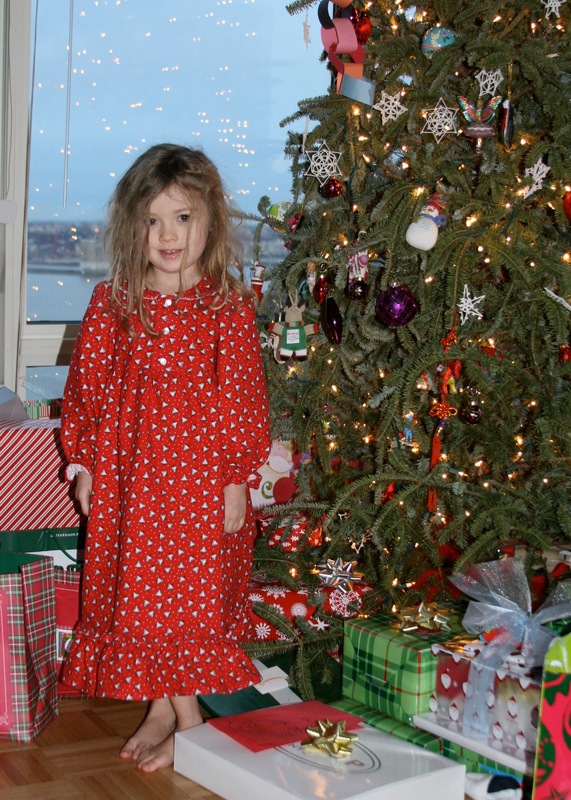 It’s a great nightgown. I do recommend it for any sewist. Beginner’s might find it a long and involved project though, but not out of reach skill-wise. Again, as with the other flannel jammie project, it took me about 10-12 hours to complete this (thanks to the stupid ex-boyfriend!). So it’s definitely not a quick project. ﻿Here’s my pattern review for Simplicity 3584. 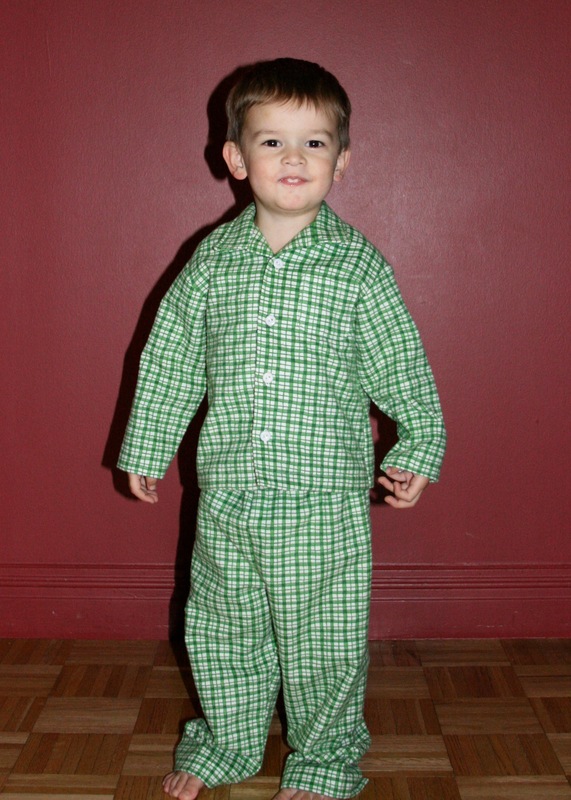 Pattern Description: Toddler’s Pajamas and Robe. I made View C, the flannel pjs. Pattern Sizing: 1/2, 1, 2, 3, 4. I used the size 3. The fit was ok. The pj top could have been longer by an inch or two and the pants were too long. The hazards of making presents and not being able to fit as you go because they are a surprise. 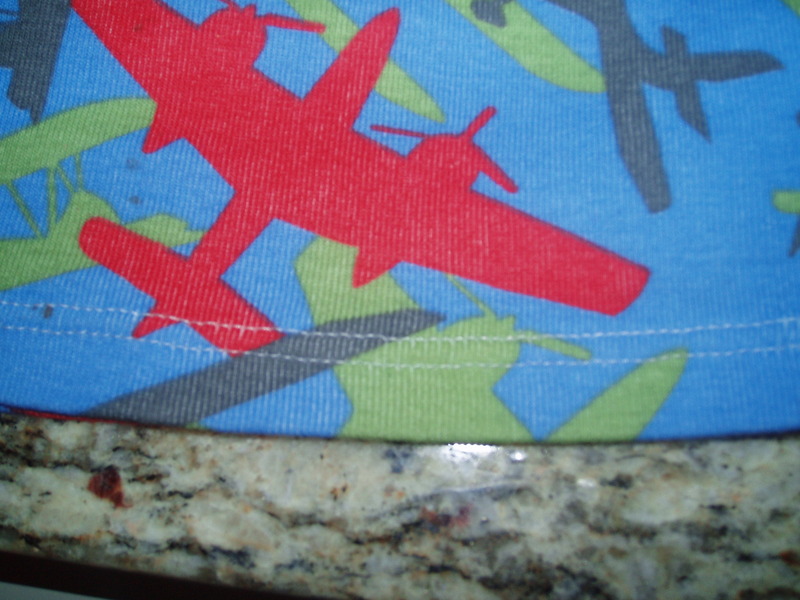 Did it look like the photo/drawing on the pattern envelope once you were done sewing with it? Yes and no. I didn’t use the button placement markings that came with the pattern. 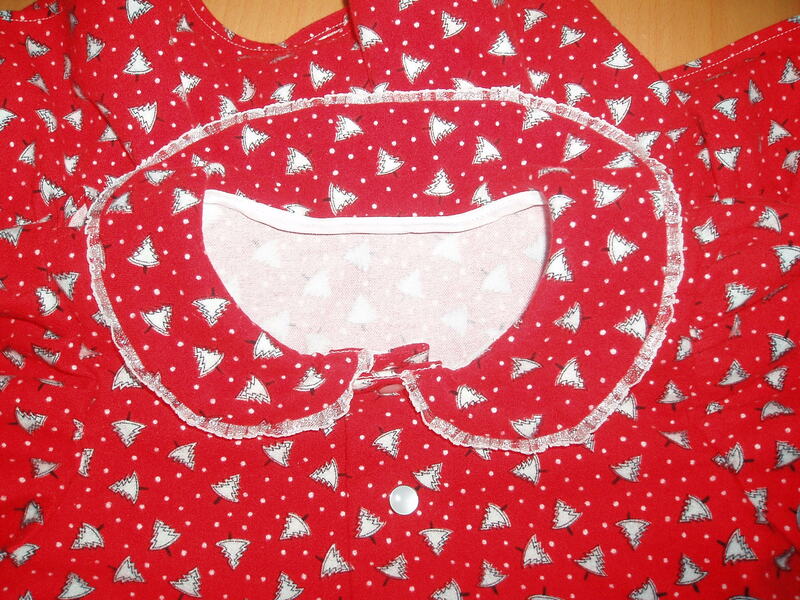 Instead I used an existing flannel pj top my son had to mark the button placement and I like it better. Were the instructions easy to follow? The instructions were great. As I have mentioned recently, I am really getting the hang of reading pattern directions now that I am two years into my sewing odyssey. Again, I warn all sewists no matter how advanced you are, that careful reading always pays off. They pack a lot of directions into one or two sentences at a time. So it’s easy to miss something if you’ve never attempted a collar before. Even with my own careful reading, I made a mistake in how I finished the collar requiring me to make and add bias tape out of self fabric to the interior finish of the collar. What did you particularly like or dislike about the pattern? 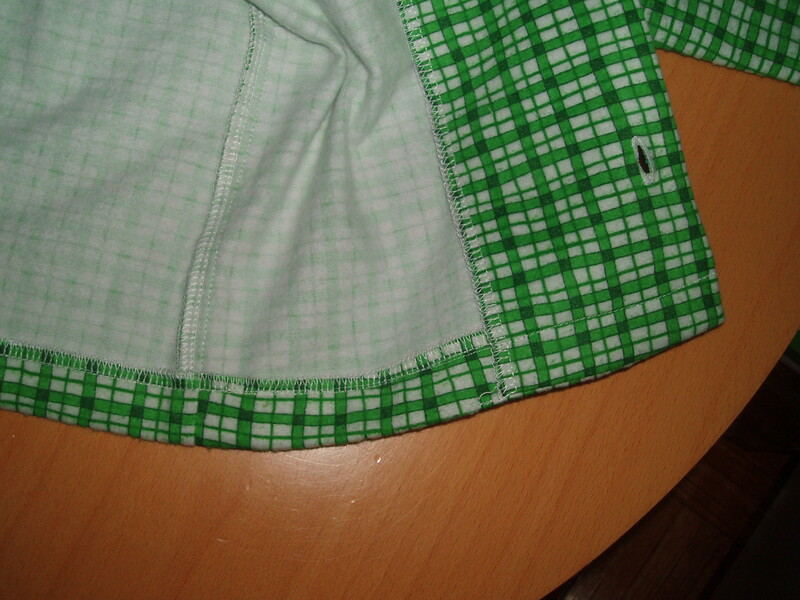 I like how simple the pattern is essentially for a button down pj with collar. That being said though, it’s still a bit fussy to make, especially if you’re under the time constraints of making an Xmas gift. I am not sure that not having a collar stand made this easier or not to sew. I think the end result is not as nice without the stand, but perfectly fine for pj’s and I doubt a non-sewist would notice the difference at all. The measurements for the waist elastic are way off. You will need to use your recipient’s waist measurement to approximate the length. And even then, my elastic was still a little loose. Also, the facings were too long at the top. 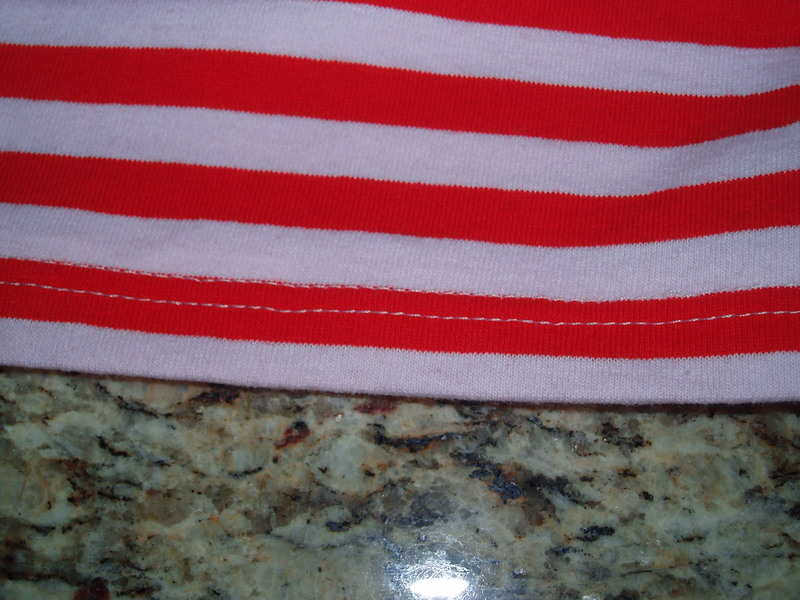 They overshot the shoulder seam entirely, so I had to catch stitch them to the back of the pj shirt (see picture above and below). Next time, I will check to make sure they line up to the shoulder seam so that I have something to which to catch stitch them. Any difficulties encountered? Any difficulties encountered were completely self-inflicted (see note about collar above). 😉 This is a basic pattern. 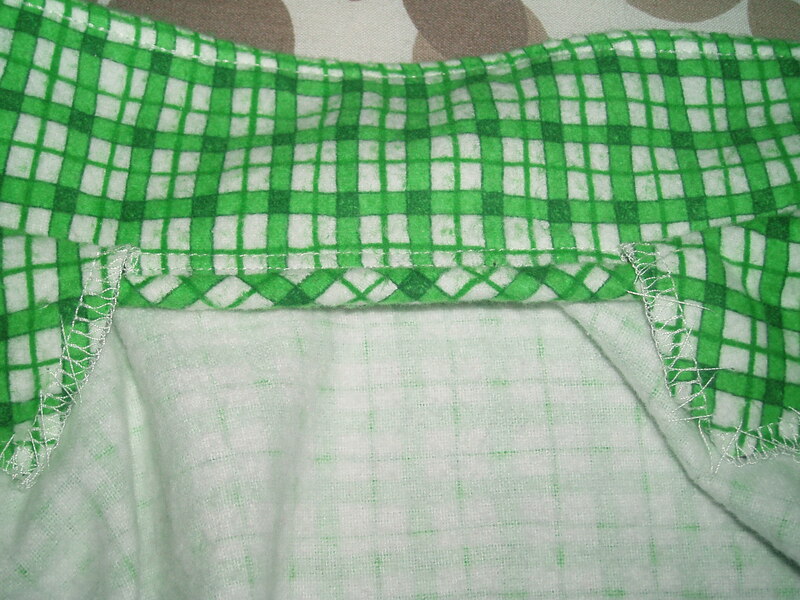 The only bell & whistle is the pocket (which I placed by lining up the plaid and not using the pattern markings). 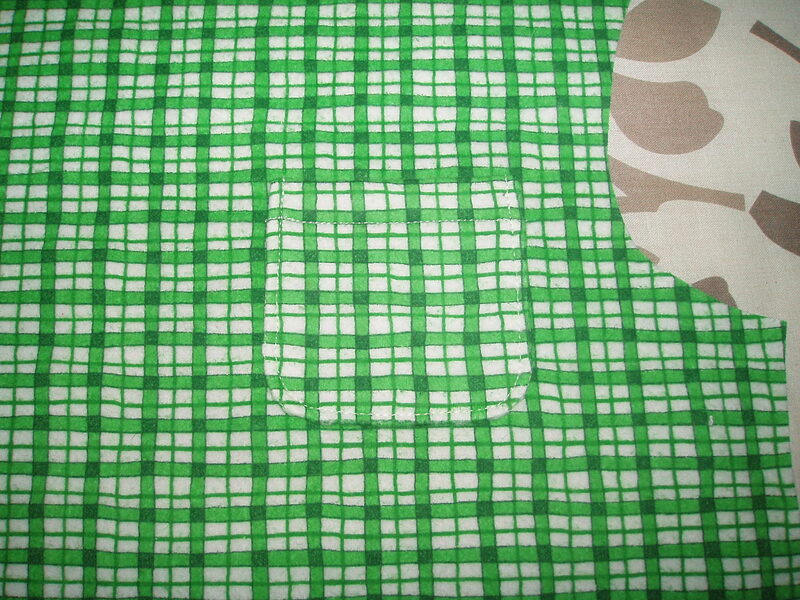 Fabric Used: A gorgeous flannel which had a great hand, was soft and fluffy, nice and thick, and easy with which to work. I bought it from Fabric.com in November but it has long since sold out. Sorry! If I can, I will buy more of it for next year’s pj’s. Would you sew it again? Would you recommend it to others? 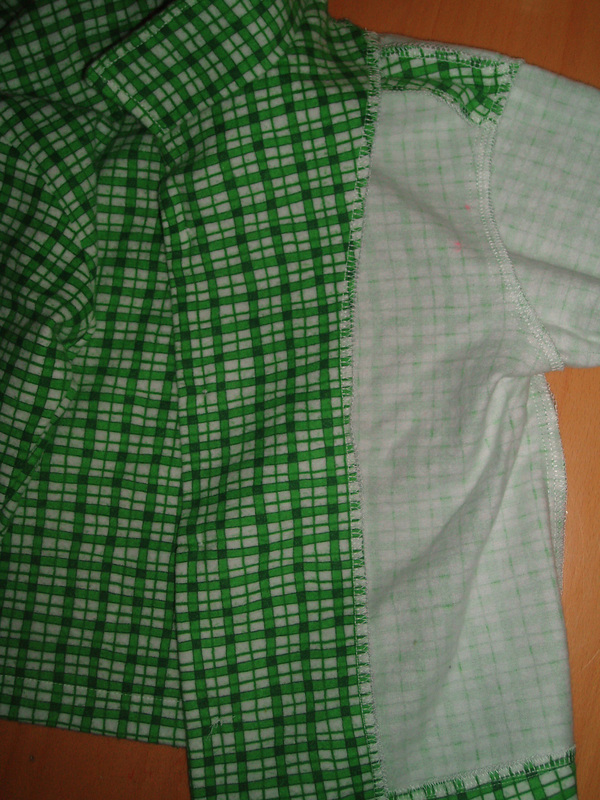 I will definitely sew it again, making the fit changes mentioned above and being more careful with plaid/stripe matching (my two fronts don’t match up but the side seams do). 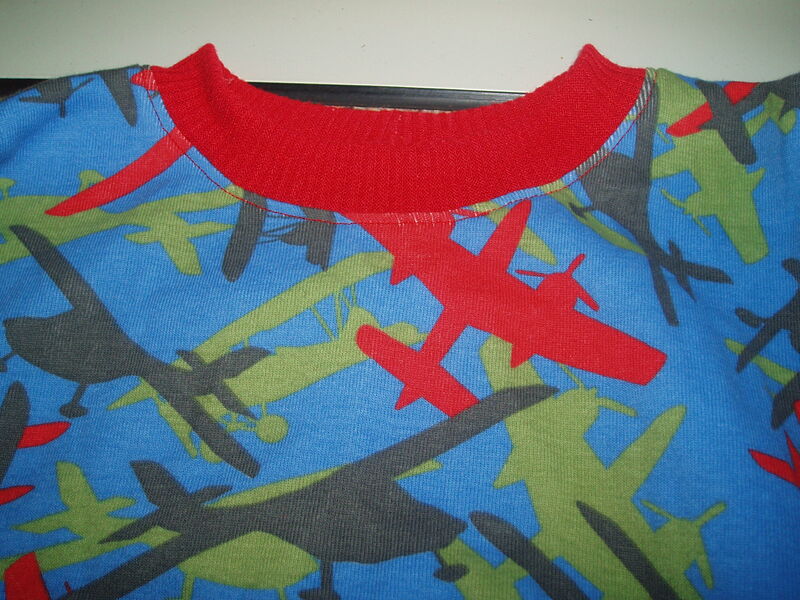 It makes such a cute jammie for kids. I do recommend it for any sewist. Beginner’s might find it a long and involved project though, but not out of reach skill-wise. I think, from tracing out the pattern to inserting the elastic on the pants, it took me about 10-12 hours to complete this. I know I’m slow, but still, that’s a long project for just one Christmas gift. But don’t say I didn’t warn you when you embark on this pattern. Conclusion: Super cute jammies! I am very proud of this project.